If you, your spouse, or your dependent child suffers any of the losses below while occupying a common carrier or rental car, or while at the airport, terminal or station at the beginning/end of your trip, you are eligible for the corresponding benefit amount. The full amount of the passage fare or rental car must be paid for using your TD Aeroplan Visa Infinite Credit Card and/or your Aeroplan Miles in order to be eligible for the benefits. The maximum benefit payable for any one rental car accident is $2,000,000 in total. In addition, benefits will only be paid if the car has not been rented for more than 48 consecutive days. Note: Paralysis benefits and Permanent Total Disability benefits are only payable if the loss continues for 12 consecutive months. If your rental vehicle is damaged or stolen while rented out in your name, you are covered up to the vehicle’s actual cash value plus valid loss of use charges (charges paid to the rental agency to compensate for the rental vehicle being made unavailable for rental while undergoing repairs). Call 1-800-880-6497 within 48 hours of an accident/theft and obtain a claim form. This insurance plan automatically protects most new items purchased anywhere in the world for 90 days from the date of purchase. If the item is lost, stolen or damaged, it will be replaced or repaired, or you will be reimbursed for the purchase price. 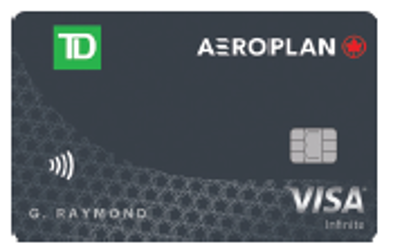 Only items that were paid for in full with your TD Aeroplan Visa Infinite Credit Card are covered by this plan. Note: There is a maximum aggregate lifetime benefit per account holder of $60,000 for all of his or her TD Credit Cards. Call 1-800-667-8031 within 45 days from the date of the loss or damage. You will be asked to provide your name, address, telephone number, account number (used to purchase the lost or damaged item), a description of the item, and the date, place, amount and cause of the loss or damage. You will also be mailed a loss report that you will be asked to complete and return within 90 days from the date of the loss or damage. Note: If the claim is for a gift, it can be made either by the account holder or the recipient of the gift. This insurance plan either doubles the length of the item’s manufacturer’s warranty coverage or extends it by 1 year—whichever is lesser. Only items that were paid for in full with your TD Aeroplan Visa Infinite Credit Card are covered by this plan. Note: The above only applies to items with warranties that are 5 years or less. Items with warranties greater than 5 years must be registered with a TD insurance administrator within 1 year from the date of purchase in order for coverage to apply. Note: You must report the claim before proceeding with any repair or replacement. A TD insurance administrator will instruct you on how to proceed. If you have to cancel your trip before it has even started, your eligible expenses can be reimbursed up to $1,000 per person and $5,000 for the entire trip. The primary cardholder, his or her spouse and dependent children, as well as anyone else authorized by the primary cardholder to use the credit card, are all eligible to receive benefits under this insurance. A dependent child must be travelling either with you or your spouse in order to be eligible. The coverage period starts on the date that your trip is booked with a travel agent/supplier and runs until your scheduled departure date. Note: The full cost of the trip must be paid for using your TD Aeroplan Visa Infinite Credit Card and/or your Aeroplan Miles in order to be eligible for the benefits. You will be reimbursed for any unused travel arrangements which were paid in advance, non-refundable, and forfeited as a result of a covered cause for cancellation. You will also be reimbursed for any cancellation fees that you incur when you cancel. Alternatively, if you miss your scheduled departure as a result of a covered cause for cancellation, you can instead choose to have your transportation costs covered to get you to where you need to be. This requires pre-approval by TD. In addition, no benefits will be payable for trip cancellation in connection with or resulting from pregnancy, alcohol/drug abuse, intentionally inflicted injuries, crime, war/terrorism, mental problems, or the participation in professional sports, organized racing, speed contests, or any other hazardous activities. Cancel your trip and then call 1-866-374-1129 (Canada or US) immediately to obtain a claim form. The amount payable under this plan is limited to the cancellation penalties in effect on the date that the cause for cancellation occurs, so make sure to call within 1 day. Note: All relevant claims forms along with written proof of loss must be submitted no later than 1 year from the date on which the loss occurred. If, after you’ve already departed, your trip is unexpectedly cut short or delayed, your eligible expenses can be reimbursed up to $5,000 per person and $25,000 for the entire trip. The coverage period starts on the date that you depart for your trip and runs until your scheduled return date. You will be reimbursed for any unused land arrangements which were part of your trip, paid in advance and non-refundable. If you are delayed in reaching the next part of your trip as a result of one of the covered causes for interruption, your transportation costs to resume your trip will be covered (also requires pre-approval). In addition, no benefits will be payable for trip interruption in connection with or resulting from pregnancy, alcohol/drug abuse, intentionally inflicted injuries, crime, war/terrorism, mental problems, or the participation in professional sports, organized racing, speed contests, or any other hazardous activities. Call 1-866-374-1129 (Canada or US) immediately to obtain a claim form. Some expenses including all transportation costs are only covered if they’re pre-approved by TD. Only non-refundable expenses are eligible for reimbursement, so make sure to call within 1 day. In the event that your scheduled departure is delayed for 4 hours or more, you will be reimbursed up to $500 per person for reasonable expenses for meals, accommodation and additional ground transportation incurred while delayed. Note: The trip must be paid for in full using your TD Aeroplan Visa Infinite Credit Card and/or your Aeroplan Miles in order for coverage to apply. Call 1-855-925-6878 within 45 days of the occurrence of the delay. You will be mailed a loss report which you will be required to complete and return within 90 days of the delay. In the event of a medical emergency taking place during a trip outside of your home province, you will be covered for any medical expenses incurred. Note: A dependent child must be travelling either with you or your spouse in order to be eligible. If an insured person has a medical emergency at the end of the trip’s coverage period, then coverage is automatically extended by 3 days. Note: In either case you must provide evidence of your actual date of departure from your home province. All relevant claims forms along with written proof of loss must be submitted no later than 1 year from the date on which the loss occurred. In the event that your checked baggage, or that of your spouse or dependent child, is permanently lost while in the custody of the common carrier, you will be reimbursed up to a maximum of $1,000 for the cost of the replacement of lost personal property that is not paid by the common carrier or other insurance. Note: The ticket must be paid for in full using your TD Aeroplan Visa Infinite Credit Card and/or your Aeroplan Miles in order for coverage to be activated. Coverage is in force while baggage is in the custody of the common carrier. Call 1-800-667-8031 (Canada and US) within 45 days from the date the loss occurs. You will be asked to provide your name, address, telephone number, account number, the date, time and place of the loss, as well as the amount of the claim. You will be mailed a loss report that you should complete and return to TD within 90 days. If your checked baggage, or that of your spouse or dependent child, is delayed by more than six hours from the time of your arrival at your final destination, you will be reimbursed up to a maximum of $1,000 for the cost of replacing essential items until your baggage arrives. Essential items must be purchased before your checked baggage is returned and no later than 96 hours after you’ve arrived. Call 1-800-667-8031 (Canada and US) within 45 days from the date the delay occurs. You will be asked to provide your name, address, telephone number, account number, the date, time and place of the delay, as well as the amount of the claim.